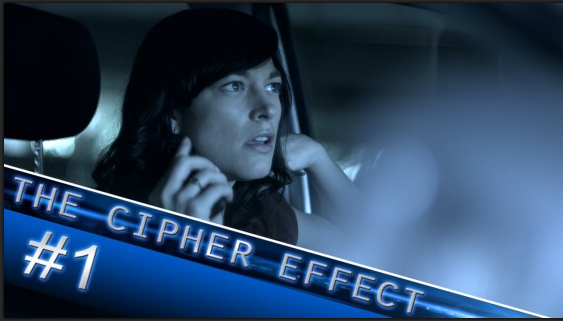 "The Cipher Effect is a sci-fi web series with wormholes, time travel, serial killers, beings outside space and time, secret organizations, and the end of the world!" That's quite ambitious - especially for an independent project. Still, one has to admire the gumption of Rhinomotion, the production company behind the series. After viewing the first episode, which premiered on May 14, 2013 on YouTube, I believe there is a good chance the series just may pull off its grand premise. From the gorgeous opening title sequence, to the big-budget look of the visual effects, to the atmospheric musical score, The Cipher Effect is off to an impressive start. Written by Glen Settle and Philip Hudson, the almost eight-minute premiere episode doesn't waste any time. It drops you right into the heart of the story. In the opening scene we meet Beth, an unassuming woman in a parking lot who is having a phone conversation many of us will find familiar. Suddenly a brilliant vortex of blue light forms behind her car, and a man appears - who claims to be from the future. Frankly it's too early to tell how well the plot will be further executed. But the writing feels honest for the circumstances created, and the cast seems to be quite adroit. The first episode left me very intrigued about the direction the series will take, and for that alone I'm going to give it a shot. New episodes are in production, but the producers are still seeking support in order to continue to produce more content. To find out more about the project, and how you can help, please visit the official web site: scifi.theciphereffect.com.